Where can I hire a fancy dress costumes near Hemel Hempstead? Where can I buy fancy dress outfits near Hemel Hempstead? Where can I buy fancy dress or party accessories in Hemel Hempstead? I need some fancy dress ideas for a party in Hemel Hempstead? Just a few miles from Hemel Hempstead is Masquerade Fancy Dress of Watford. 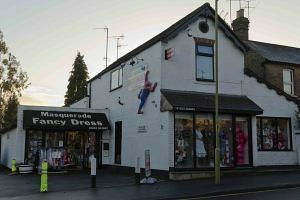 Masquerade has a wide range of quality costumes and accessories which you can hire and a variety of outfits and accessories to buy. Call or come and visit us – free on-site parking!